There’s a hanging basket for everyone, regardless of sunlight, style or skill level. Hanging baskets bring you beauty, privacy and shade, free up space on the ground and dress up a front porch like nobody’s business. But while pom-poms of petunias and Boston ferns have stood the test of time, they aren’t necessarily much to get excited about. Instead, create a hanging garden of your own design by choosing interesting plants with a creeping, spreading or trailing habit. Anything that hangs is fair game, but avoid plants that become too rampant, heavy or thirsty for the confines of their little nest. Here are 40 plants that were made to hang loose in your home and garden. Kicking off the list are these happening houseplants. Some happened to happen decades ago (like the spider plant), others are enjoying a comeback (Tahitian bridal veil), and still others are only now becoming popular: Mistletoe cactus, turtle vine, peperomia, ‘rain of coins’ (sounds painful), and other oddities from the rainforests are not only in fashion, but quite tolerant of neglect. 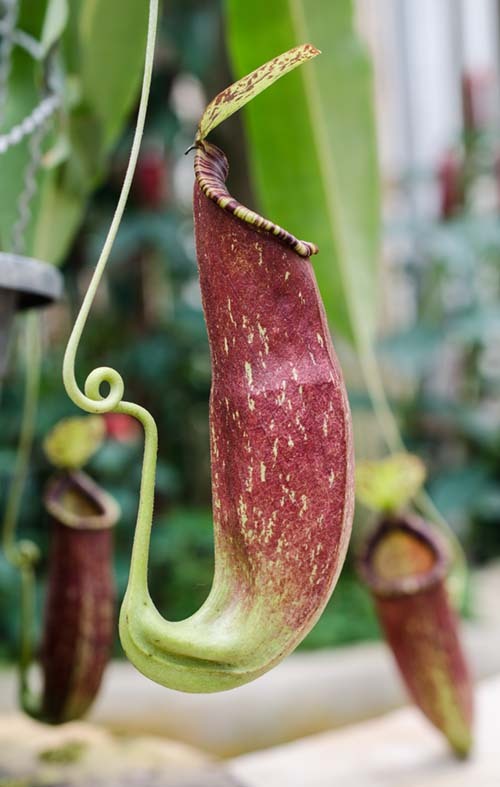 Asian pitcher plant is an exception, though, since it requires both humidity and plenty of soft water to produce its wicked fly-catching pitchers. But who wouldn’t want a hanging carnivorous plant to greet mosquitoes and visitors? 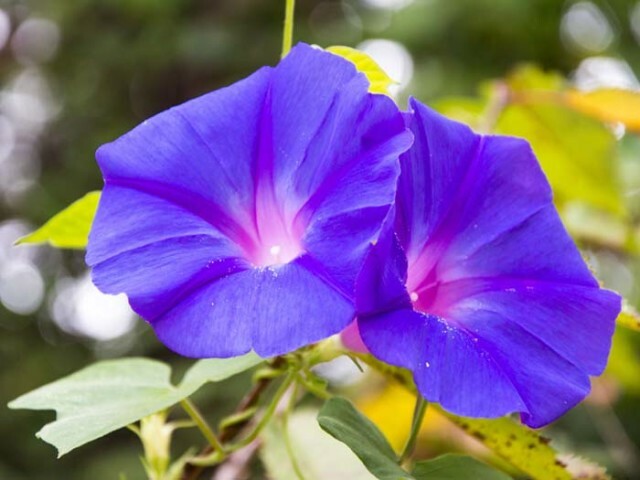 Many of the houseplants listed above are great fits for warm days in the shade, but these landscape plants offer either flowers (such as fuchsia, walking iris, and begonias) or, in the cases of gold Japanese sedge and creeping Jenny, cold-tolerant foliage. Many ferns are great fits as well, provided they’re drought-tolerant enough to cope with drying winds and forgetfulness. Boston fern is the classic choice, but choose ‘Macho’ fern, ‘Kimberly Queen’ fern and other relatives for a twist on an old favorite. If you were to picture a life of leisure, you might imagine lounging around while someone feeds you grapes. 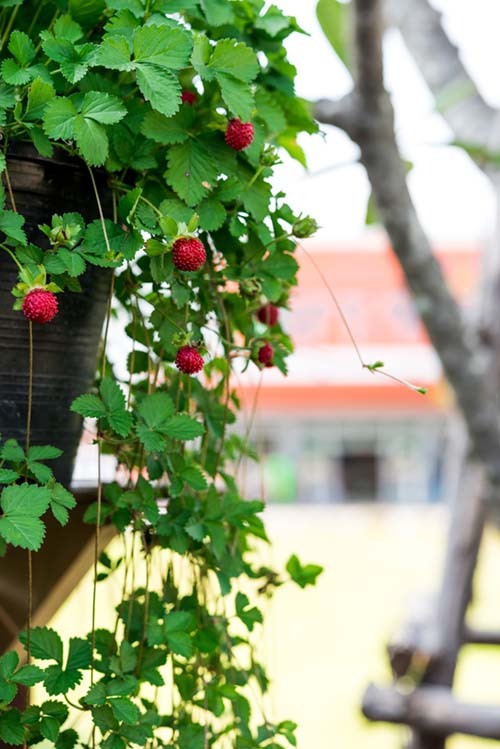 While grapes are too rambunctious and needy for hanging baskets, strawberries are about as good as it gets. The berries naturally hang over the sides of the baskets, making them easy pickings at the end of a hot day in the garden. Tomatoes are the next best thing, but choose a dwarf variety like ‘Micro Tom’ that won’t outgrow its space. If you’re a home chef with limited space, try growing herbs in baskets as well; no more stooping over in the dirt to gather your ingredients! Have a sunny south-, east- or west-facing balcony and don’t mind watering on a regular basis? Your favorite houseplants may have burned to a crisp with all of that direct sunlight, but who cares? You get to grow flowers, and lots of them. Remove the corpse of your Boston fern, dirt and all, replace with fresh potting mix, sprinkle a few vining flower seeds (moonflower, morning glory, black-eyed Susan vine and cardinal climber will do nicely), water them daily and keep an eye on your balcony: It may soon be smothered with blooms. If you have a south-, east- or west-facing balcony and occasionally wander out to find dead plants you forgot were even there, then these tough and drought-tolerant hanging succulents are the way to go. With so many great options, the hardest part of creating your hanging baskets could be narrowing down your choices. These are great suggestions. Hanging baskets can make a gorgeous addition to so many spaces. Love the look of some thoughtfully chosen, and well-maintained hanging baskets on a porch or sun room.